Every time I look at the home screen on my phone, I have to smile. The photo is of a chubby two- year-old hand proudly holding up a wriggling worm. This, of course, makes me think of my dad. Now some might think that it’s a bit odd to associate one’s father with such a lowly creature as a worm. Not me. You see, one of my strongest memories growing up is of working in the garden with my dad when I was very young. Well, my guess is that while he was working, I was playing in the dirt. Regardless, one of us came upon a worm. A long, pink, slimy worm. I was terrified, certain that it would suddenly spot me and lurch toward me in full attack mode. My father, who grew up on a farm, sensed that this was one of those “teachable moments” parents are so very fond of. 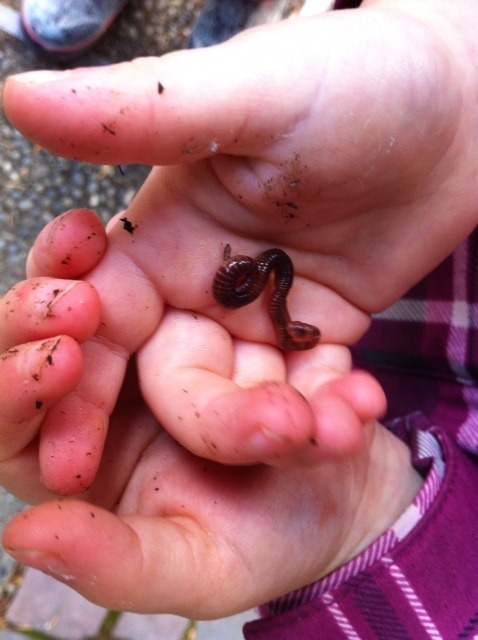 He gently started to tell me all the wonderful things earthworms do for the soil. I remained unconvinced. Dad decided that instead of using words, he would just show me how harmless worms really were. I was instructed to hold out my hand. Being an obedient and trusting child, I held out my hand. When my father gently placed the worm in my palm, I shrieked and tossed it as far away from me as I possibly could. Dad sighed in exasperation. He couldn’t possibly let me get away harming creatures and he certainly couldn’t understand how I could be afraid of a simple worm. Looking back, I realize that my father knew a lot more than I ever gave him credit for. I often find myself thinking back about the things he had given me unwanted advice on. Advice that now makes perfect sense. Thanks Dad, for all those life lessons, you struggled to get through my thick skull. I finally get it. Well, most of them. If you notice, I’m not the one holding that Killer Worm. ~~~~~~~~~~~~~~~~~~~~~~~~~~~~~~~~~~~~~~~~~~~~~~~~~~~~~~~~~~~~~~~ Thank you for reading A Slice of My Life. I hope you enjoyed reading this as much as I enjoyed writing it. If you liked this post, why not consider “liking” my Facebook Page, subscribing by mail (at the upper right) or signing up in a reader. I’d be thrilled and you would never miss a post! 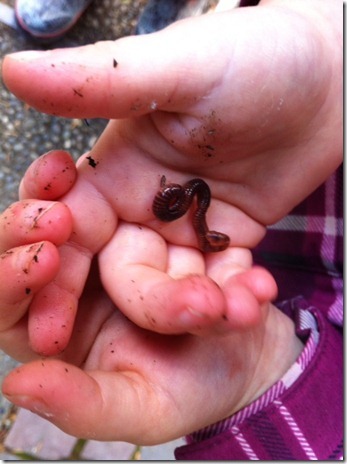 This entry was posted in Family, Gardening, It's all about me!, It's all Relative and tagged Dad, Father's Day, gardening, life lessons, worms. Bookmark the permalink. Awww…don’t be sad, there is a lot more to life than worms! I’ve been reading your blog lately and I’ve really been enjoying it. I love your writing style…and I just have to say, it sounds like you have a great dad! This is just the sweetest blog! It made me sad it made me giggle and most of all it made me smile. Very interesting post. It is really a sweet memory. You have great father. That is very sweet 🙂 I love finding worms in my garden.